9th Annual Handmade NW, Formal Holiday Artisans Fair! 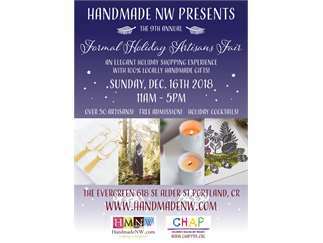 Sunday, December 16th, from 11 am – 5 pm, Handmade NW brings an elegant holiday shopping experience to the heart of SE Portland. In its ninth year, this event has returned and is now located at the newly renovated Evergreen Ballroom at SE 6th and Alder! With FREE on street parking for the day! Handmade NW aims to support an economy of crafters and artisans who have committed to bringing quality handmade goods to our community. We believe that the recipient of a handmade gift receives something that is one-of-a-kind, and made with care and attention that can be seen and touched—quality that is the result of skill and craftsmanship unachievable through large-scale manufacturing. Handmade NW encourages all to support the local economy, and buy local handmade gifts this holiday. The Evergreen, previously occupied by the historic Orient Lodge, No. 17, is conveniently located in Portland's central eastside. A full-sized elevator and wide staircase, makes it easy to access the newly renovated 2nd floor ballroom and mezzanine. This FREE event will have more than 50 local artisans featuring items for moms, dads, kids and grans—even the hard-to-shop for geek in your life! You can also enjoy live holiday music and a local beer, wine or cocktail while you shop! How’s that for setting the mood! In the spirit of giving, this year Handmade NW and its participating artists are gathering funds and art supply items for Children’s Healing Art Project (CHAP). Please bring your donations of NEW and USED art supply items to stock Children’s Healing Art Project shelves, there will be bins onsite for your donations. Items in high demand at our local hospitals are NEW sketchbooks, NEW colored pencils and NEW Model Magic Clay. Used art supplies are implemented for the in house workshops at their facility.